Cairns Semi Submarine Tours – How to Choose Top Tips? Looking for tips on how to choose a Cairns Semi Submarine Tour? Read on and find the best Semi-Submarine tours from Cairns and Port Douglas, Australia. Spot the differences and make an informed choice about where to spend your money. Top 10 tips for Semi-Submarine tours from Cairns or Port Douglas. Semi-Submarine Tours can only be enjoyed as part of a full day reef experience, like Reef Magic Cruise or Quicksilver Cruises. 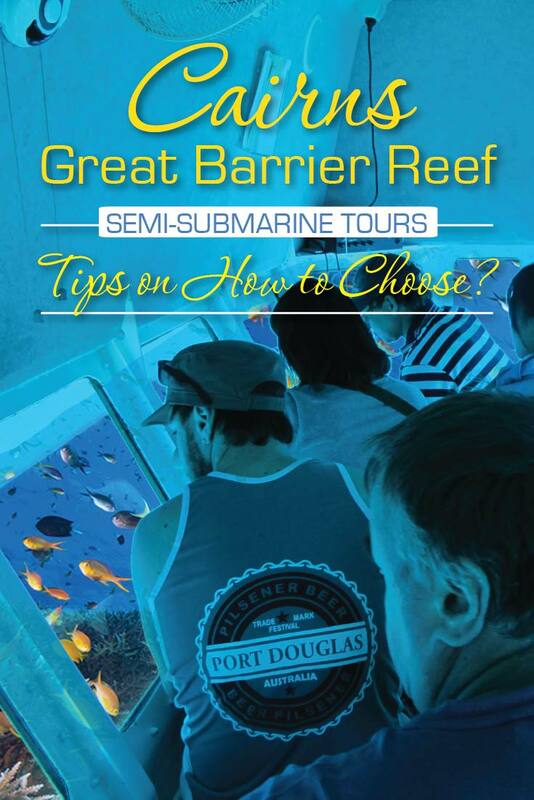 There are no stand-alone Semi-Submarine tours in Cairns or Port Douglas. They are always part of a reef trip package. The best locations to try a Semi-Submarine tour are on the Outer Barrier Reefs away from the Islands and Sand Cays and in the deeper clear water. Choose a nice sunny day so lots of sunlight is penetrating the water. This will offer the brightest color in the coral and reef fish. Sit up the front of the Semi-Submarine, you get to see the turtles and sharks before everybody else and before they are scared away and swim off into the blue. If you get sea sick take sea sickness tablets. Semi-Submarines can bob around a little bit. This can make some people feel a little dozy. Semi-Submarines are great for people who do not swim. Enjoy an underwater experience that is easy to look at the Great Barrier Reef. All Semi-Submarine tours are 35 / 40 minutes long. You can ride them as many times as you like there is no limit! The best time to try the Semi-Submarine is on the incoming tide! Reef fish and marine life become very active on the incoming tides. When taking photos with your camera, put your camera lens on the glass windows of the Semi-Submarine and turn off the flash! This will give you the best possible photos underwater. Below are three reef tour companies that offer unlimited Semi-Submarine tours. Both Reef Magic and Great Adventures operate from the Reef Fleet Terminal Cairns. The third company Quicksilver operate from Port Douglas. Great Adventurs operate a day boat that visits Green Island for 2 hours in the morning. The next vessel will then take you out to the Outer Barrier Reef pontoon located at Norman Reef. It is at the pontoon you can emjoy unlimited Semi-Submarine rides. Also included in your ticket price is snorkeling, underwater observitories and buffet lunch, morning / afternoon tea. A professional polite crew visit the here to find out more – Great Adventures Green Island & Outer Barrier Reef Adventure. Semi-Submarines are a great way to explore the Great Barrier Reef. With the top 3 reef tour companies mentioned above, you should be able to find a trip that is perfect for your requirements. If you have any further questions send us an email: info@cairnstourinfo.com.au or give us a call on PH: 07404111635. ← Silverswift Vs Silversonic Vs Poseidon Vs Tusa Dive Learn the Truth!